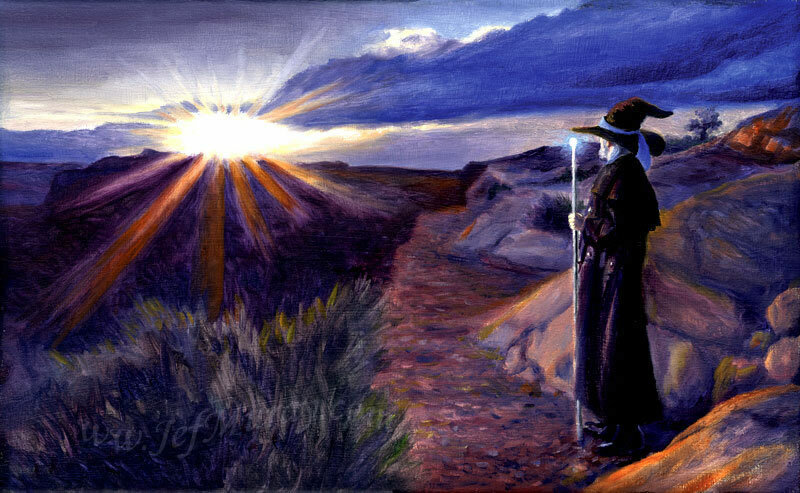 As a critically acclaimed and internationally-known artist, illustrator, storyteller & wizard, Jef Murray (www.JefMurray.com) wears many hats. His illustrations of the characters and scenes we find in Tolkien, Lewis, & George MacDonald have a capacity for capturing the ineffable. This is why I like to call him, simply, The Wizard. For he is a Wizard, unweaving the aesthetic spell cast by Hollywood. A Latin phrase I live by is Res Ipsa Loquitor, meaning "It speaks for itself." Jef Murray's work speaks for itself. It doesn't argue. It is not didactic anymore than Michelangelo's Sistine Chapel is. It simply shows rather than tells. It speaks for itself. Like all classics, his stories can break your heart and make you smile all with the wink of an eye. "The limits of my language are the limits of my world." said enigmatic philosopher Ludwig Wittgenstein. One does not have such limitations as an artist. Jef’s list of credentials is too long to include, but here are some websites where one might find out more about him and his work: JefMurray.com, Oloris Publishing, TolkienLibrary.com, IntegratedCatholicLife.org, Twitter, Pinterest and Facebook. In anticipation of MythCon, Mythmoot III and ALEP3 (alep-ky.us), I asked to interview the Wizard. Not a day later the Signum Eagle himself came to me and told me the interview would gladly be granted. BY: So Jef, you've been one of the highest in-demand Tolkien artists at conventions and conferences, and have participated in a number of them. We shall get into a few specifics in a moment, but generally why do you think it's important to go to these events? JM: Well, first, let me welcome you to my abode. I enjoy visitors! And we’ll get the kettle on for a spot of tea first…. …there we are! Now, Lorraine has promised us some biscuits later on as well. But, in the meantime, do make yourself at home. Now, as you were saying….? BY: Yes, thank you. I was asking why you think it's important to go to conferences? 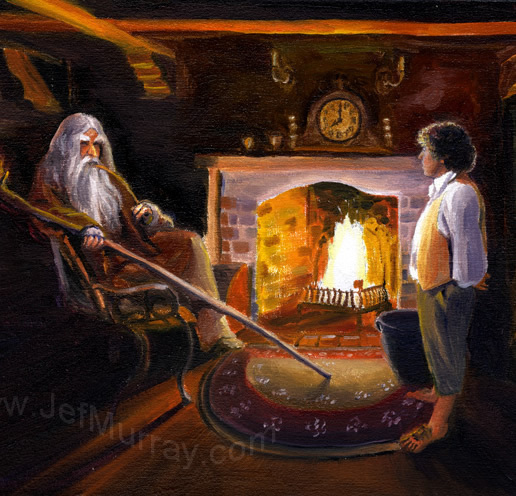 JM: Well, I do, indeed, regularly attend Middle-earth themed conferences and conventions, worldwide, and I have been blessed with the opportunity to show my paintings and sketches at these as well as at more dedicated exhibitions of my work. I’ve also been a speaker at civic, religious, and academic gatherings on topics as far-ranging as Christian themes in Tolkien’s works and in fantasy works in general, on Fairy Tales as vehicles for conveying truth, on my Middle-earth and Narnia-themed artwork, of course, but also on Gothic artwork and on the writings of Bram Stoker(!). In addition, I’ve spoken on dragons, on writers like Flannery O’Connor and G.K. Chesterton, and even on the topic of Gregorian Chant. The life of a wizard, as you can see, is certainly never dull! But, back to your question. You asked how important conferences are, to me, as an artist and writer. Let me broaden the question a bit and discuss how important such gatherings might be for anyone at all. Because, you see, it has become clear to me over the years that all of us are sub-creators in our own way. And I’m using that term, first coined by Tolkien, to highlight the fact that the actions of our own individual inventiveness are distinct from true creation, which can only be made manifest by the one true Creator. Tolkien believed that the act of sub-creation, which mimics the inventive genius of God, is the very act that brings us closest to God, who is, after all, infinitely creative. But, I digress. It’s something I fear you may have to put up with in me! It is a foible common to most wizards of my acquaintance…. BY: ALEP III is coming up this autumn. In fact some of the people and places in your book "Seer" were inspired, were they not, by ALEP? Could you tell us a little about that event for folks who might attend? JM: A Long Expected Party, or ALEP, was first held in 2008, and it is a Tolkien-themed conference that defies description. Less a conference than a completely immersive experience, the event has been held every third year since it began, and this September will mark the third reunion of what has become, for many of us, our extended Shire family. ALEP 3, or AL3P for short, will be held September 24th through the 28th in Shaker Village, Kentucky. During those days, all of Shaker Village will become The Shire(!). Most participants will be staying at the village, and as with the very first ALEP gathering, many of us will remove the yokes of care and worry from our shoulders from the moment we take our first steps onto the green hills of the Village. And we will not concern ourselves with the outside world again until, many days later, and deeply refreshed from having spent so much time with good friends, we must leave the Shire behind once more. How do I describe what happens in the intervening days of ALEP? It is surpassingly difficult! We awaken each morning and walk the unpaved stretch of road that connects all of the dwelling places with the main dining hall. In the cool mists of daybreak, we bid good morning to Elves, Hobbits, and Dwarves. The breakfasts are hearty and plentiful: enough to put a smile on the face of even the most ravenous of halflings. And that is only fitting, as we will need that provender to stoke the fires for each day’s many adventures. BY: Adventures? What sort of adventures? JM: Well, there will certainly be something to be done or to be experienced for everyone! There will be archery lessons, music making, sword fighting, folk dancing. There will be demonstrations of artwork and costuming. There will be lectures on books of interest to Middle-earth fans, including academic treatments of various aspects of Tolkien’s writings and the many films, calendars, paintings, and musical settings inspired by him. There will be more general discussions of fantasy topics like dragons, giants, ghosts, goblins, and other medieval myths and tales. There will be hikes in the woods, star-gazing, skits, songs, poetry recitals, even riverboat cruises. Later in the evening, we will gather at the Dancing Pony to share pints of ale and goblets of homemade wine, for impromptu recitations, for the singing of lays, and even for the sharing of ghost stories. In short, one does not simply attend A Long Expected Party; one becomes a part of it. And your level of participation is limited only by your willingness to step into the adventure and let yourself go. BY: Speaking of Seer, it received very warm reviews, both in the States and abroad, even though it is a difficult book to describe. Can you tell us a bit more about it, and about its upcoming 2nd printing? JM: I’d be delighted to. But, you are correct, it is a difficult book to describe, and I even had the singular experience of having to try to help a librarian catalog it for the first time. Was it a book of short stories? Not exclusively. What about a collection of artwork? Well, somewhat. But, it also contains poetry and essays that range over quite a number of topics. It is, in short, a journal, one that I made over the course of many years, and that has no fixed organizational principle other than that most of the tales fit into the seasons of the year in a satisfying arc, and that made the progression of its tales a bit less haphazard. In addition, certain characters appear throughout the stories, popping in and out in unusual ways and bringing underlying weight to bear on the individual vignettes. But, what are the tales, poems, and essays about? Ah! There we have an easier time! They are about angels and demons, wizards, vampires, magicians, ordinary folk struggling with difficulties like loneliness, emptiness, hopelessness. They are about regaining hope and magic in lives that often lack both of these things, whether at work, in wild places, or in dreams. As a writer, I tend to work in vignettes rather than in epic tales. This frustrates some of my readers, who want a long narrative that carries them along. But these tales do have subtexts that follow throughout them, and, as I mentioned, characters that reappear in new and interesting ways as you progress through the book. BY: And now there is to be a second edition? What has changed? JM: Yes, I’m very grateful to the good folks at Oloris Media and Oloris Publishing for having suggested an updated version of Seer. The new edition will feature full color images in the place of many of the black-and-white ones in the first edition. Also, there will be two additional tales added. One of the criticisms of the original edition of Seer, and one that I felt was very justified and insightful, was that the book opens with a tale, “The Watchman,” that seems, to most who read it, to be the opening of a much larger work. But then the characters appear to be dropped for other stories. That’s not strictly true, as many of them do reappear later in other tales. However, the observation that the opening tale is part of something bigger was accurate. That larger work is still in progress, but by adding two additional chapters to the first, I hope to better integrate the characters that appear later in Seer, and to clarify a bit more about them. BY: And will you ever publish the full tale as a novel? JM: I would love to if time permits, but at last count I was up to some 21 chapters with no end in sight. I fear that completing the full arc might take many additional years. In the meantime, I’m continuing with other projects that put less demands on those who enjoy my work. BY: And what projects are those? JM: Well, for one, my fifth calendar has just now become available. On my own, I have created three in the past that were Middle-earth themed and one that was Narnia-themed; these in addition to working on calendars for Heren Istarion and Beyond Bree. But this one is something new: a calendar featuring Fantastical Beasts and Beings. BY: Beasts and beings from Middle-earth? JM: Yes, some from Middle-earth, and some from Narnia, and some from other locales in the realms of faerie, include some that one might encounter in the Harry Potter series. There will be Elves, Hobbits, and dragons, as one might expect. But, the calendar also features centaurs, mermaids, naiads, dryads, and even some of the less savory and frightening creatures like fire demons/Balrogs. Brandon Marshall Young is a student at Mythgard Institute and is a student of Law and Philosophy. He is a former High School Teacher, Vaticanista, and is working on a thesis on "The Phonoaesthetics James Joyce and J.R.R. Tolkien." He is also a prolific podcaster ("The Silmarillion Seminar") with published articles on a variety of topics including linguist Noam Chomsky and Harvard psychology professor Daniel Gilbert. He has a dog named Kobe, and a sword named Retaliator. His life has been devoted to the quest for knowledge, the longing for Love and an unbearable pity for the suffering of mankind.